Above: St. Catharines Standard, Mar.27, 2009. Click photo to enlarge. Got to give U.S. President Obama some credit for recognizing that our Canadian single-payer, state-run monopoly health-care monstrosity is NOT an acceptable template for the States to follow. Has Michael Moore heard what his president is saying? Moore ejaculated that Canada's state-run health-scare system was the best ever, painting it as a veritable health care Utopia... like Cuba's and North Korea's... so when is Moore going to deride Democrat Obama for his views? Canada's abysmal system ISN'T GOOD ENOUGH for the States! The American system is in many respects far superior to Canada's; socializing it would only make it worse. We see in Ontario that the ombudsman is about to investigate the way in which the local Niagara LHIN (the puppet organ of the Ontario government's health-care monopoly - appointed, funded, directed, and created by the Liberals) instituted its health care cuts recently, with little public consultation, in regards to the NHS HIP cuts and the closure of health services in south Niagara. Is this the kind of system Americans want - a sicko, unaccountable government-run monopoly with sole discretion of their health care, cutting health coverage and services, while at the same time increasing their taxes and denying citizen-patients the choice to opt out and pay for their own care privately? Hope not. "Linda Williamson, a spokeswoman for Ombudsman Ontario, said the investigations are focused on how the LHIN handled its mandate of “community engagement” when dealing with health-care services. "The LHIN has a legal mandate to do that, so (Marin) is asking, ‘Was the process fair?’ ” she said. While the investigation will focus on the LHINs public consultation process, Williamson said Marin will not assess the restructuring plans of either hospital system. “That is a policy issue, and he is not looking into the merits of the policies of a hospital. He is not going to say, ‘That hospital should not be closed, but that one should be.’ That is not his mandate,” she said. The NHS restructuring effort, called the hospital improvement plan, is introducing sweeping changes to local hospitals including the centralization of services at “centres of excellence” in certain locations." Strange, isn't it, how McGuinty's Liberals are still hiding their state-run hospital monopoly from complete ombudsman scrutiny, allowing the ombudsman's office only tangential access to certain pre-selected aspects of their health-monopoly, but not enough to actually perform a full-scale review. Did the Liberals - the sole payers within their health-care monopoly -cover up any correlation between their health-care budget cuts and the NHS's death rate? Did Jim Bradley repeatedly ignore answering questions from his own constituents about his Liberal's failing health policies, because he feared to implicate himself in his own Liberal health-care mess? Any independent scrutiny of this Liberal mess is welcome, but this piece-meal approach simply allows our drowning monopoly (along with its useless Liberals) to tread water a little longer. And the ombudsman's powers are, ultimately, limited when it comes to actually enforcing any changes that may be recommended: they are pre-ordained to be only 'recommendations' with certain moral suasion - a majority Liberal government can simply ignore them. The Suzanne Aucoin case - again, from Niagara - scrutinized by the ombudsman two years ago is an example - what was really changed? The answer - not much! Liberal-run healthcare's "cruel game", as the ombudsman described it then, still continues, as bad as it ever was... and remember, secretive Jim Bradley was one of the Liberal's staunchest health-monopoly proponents. The Liberal's state-run health-care monopoly is interested in its own institutional survival and perpetuation, not in transparency, accountability, or servicing patients. Cost-and-service-cuts, while also raising taxes, are the government's priorities - something the Michael Moorists can't fathom could happen with their naive benevolent-state-run-health-care fantasies; they pretend this is only the nature of supposedly-evil insurance companies: but, a government-run monopoly is worse. Now that Niagara's LHIN is under ombudsman investigation, the LHIN and the NHS conveniently don't want to talk about their high-handed manoeuvres! The St. Catharines Standard actually reported for once (in "Keeping an eye on the LHIN", Mar.26, 2009) that local Liberal health care monopolist, MPP Jim Bradley didn't return the newspaper's request for an interview - join the club, what else is new? Liberal Jim Bradley's agenda is to smugly drone on about only what he wants to reveal, on his own selective terms; he could care less about responding to requests from constituents, let alone reporters - unless maybe it's some nudge-nudge-wink-wink Liberal friendly reporter. The Standard first mentioned that they contacted Conservative MPP Tim Hudak, who also didn't respond, THEN they mentioned Bradley. But Hudak isn't in the majority government, is he? Jim Bradley is a senior cabinet minister in the majority Liberal government - it is Bradley, first and foremost, who should be interviewed and critiqued on a daily basis, and held to local account for everything his Liberal government does. That kind of accountability has sadly been lacking in Niagara for years - Good Ole Jim usually gets a pretty soft ride. The LHIN is an artificial Liberal creation, an obvious political-buffer built to shield the Liberals from actual responsibility regarding health care - the LHIN appointees march wherever Liberal Premier McGuinty and his current health minister David Caplan, direct them. An investigation into the LHIN should be seen as an indirect investigation into the practices of the McGuinty Liberal government. It's plain that the NHS has been underfunded for years, as Liberals cut health coverage and increased health taxes. Smitherman as much as admitted that the NHS was spending like a drunken sailor (or perhaps like a typical unaccountable state monopoly??) without actually detailing where this so-called profligacy was occurring; nevertheless, through his intimation and intimidation, hospitals were ordered to rein in spending (leading to the NHS's Kitts HIP report - to which, by the way, did Bradley ever officially respond?) The blow-back of these decisions was ignored by the Liberal government - and by Good Ole Jim - who have a burdensome obligation of providing health care to all Ontarians - SEEING AS THEY ARE THE SOLE MONOPOLIST PAYER. This Liberal dichotomy of political purpose is almost schizophrenic in nature - trumpeting the manufactured virtues of an expensive, failing health-care monopoly, while cutting services in the same monopoly they claim to uphold. What hypocrisy for McGuinty's monopolist Liberals to run deficits themselves, while ordering Ontario's hospitals to balance their budgets - budgets, let's not forget, which were mandated, pre-determined and artificially under-funded by the very same Liberals. What grand Liberal Healthcare Duplicity. 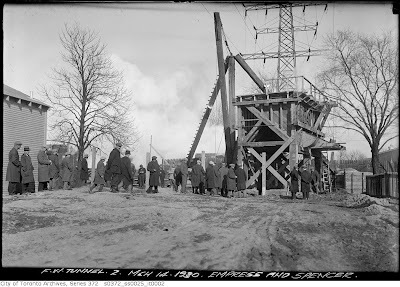 Below: This Feb.9, 1911 photo from the Toronto Archives only states that it's in Parkdale on the GTR (Grand Trunk Railroad) tracks. I've often wondered where this photo had been taken from, and now believe it is actually looking westwards from Dufferin St., standing just north of the level-crossing tracks. The Dufferin Loop is at the far right, the Exhibition grounds are to the left. 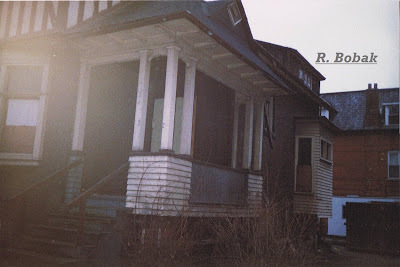 A house at the corner of Ft. Rouille and Springhurst is the same in both below photos, as are some of the houses visible in the far centre-right distance. In the distance somewhere around Tyndall Ave. there appears to be an interesting house with a large tower. above: Apr.13, 2009 - same view; the same house (on the south-west corner of Springhurst and Fort Rouille) is still there, at far upper right. Dufferin Loop is still at the right. The railroad right of way has been excavated and the tracks have been dropped lower, and the Gardiner now runs south of the tracks. Some of the houses in the right distance are 'newer', while others may have been demolished. 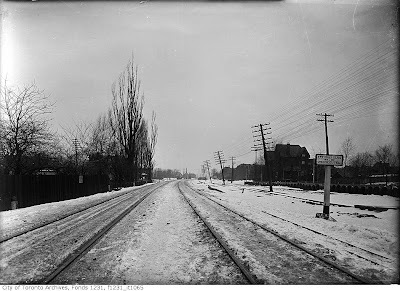 below: Feb.4, 1914 - looking north from Dominion St. (approx. today's British Columbia Rd.) across field towards the GTR tracks and the rear of houses south of Springhurst Ave. Note the hydro towers, located south of the tracks (where the future Gardiner expressway would later run), bringing in electricity from Niagara. Note the two houses side-views seen at the end of Spencer are the same ones seen today. Note again, interesting house tower seen along or behind Tyndall Ave. (a bit to the left of the hydro tower), as also seen in the photo at the top. 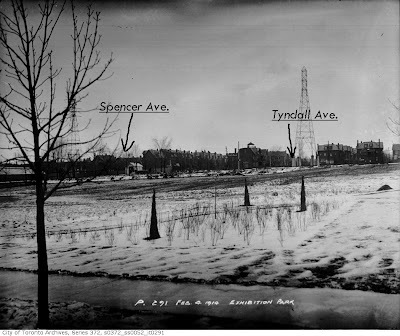 Was this tower perhaps on a house which was on Springhurst Ave, between Spencer and Tyndall? Seen to the right of the hydro tower at Tyndall are the rears of houses which front onto the south side of Springhurst, and further in the distance, you can see the front gables of houses which sit on the west side of Tyndall, north of Springhurst. above: view of the houses at the end of Spencer Ave., as also seen earlier above. 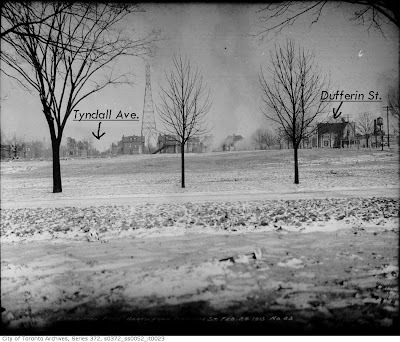 below: Feb.24, 1913 - again, looking north from the Exhibition grounds at the houses located between Springhurst Ave. and the railway tracks; Tyndall Ave. is at the left, Dufferin is to the right. Note the steam emanating from below at the centre of shot - this is where the new railroad station (located just west of the Dufferin bridge) was built after the GTR tracks were dropped; so steam engines were idling there at the station. Note same two houses just to the right (east) of Tyndall Ave. (on each side behind the hydro tower), these are same two houses seen in the second last above photo, and also in the very first shot above. (Note house in centre far right, which must have been located behind the Government (later Arts Crafts and Hobbies) Building, which would have been built a year earlier, in 1912) The Government Building should be to the right, just out of frame. above: a wide angle view of the same area as seen Apr.13, 2009. Click to enlarge photos! 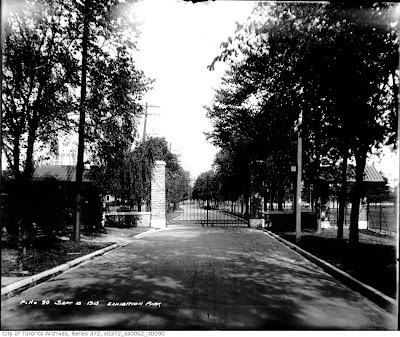 below: Sept.15, 1913 - a positively idyllic entrance to the Exhibition grounds, looking from the west along a treed Dominion St. A bit of the dome on the Arts and Crafts Building is seen at the left, behind the trees. above: same location, Apr.14, 2009 - hard to believe along here was once that quiet gate to the fairgrounds. The dome (of the now-Medieval Times) is still seen at the left, behind the chestnut tree. below: The dome can be seen on the Arts, Crafts and Hobbies building, Sept.7, 1936, looking at the building from the south-east; Dufferin runs north along the right. above: same view, Apr.13, 2009, some twenty years later. 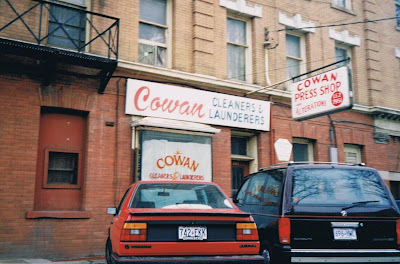 Our old Cowan Cleaners is gone. below: ca. 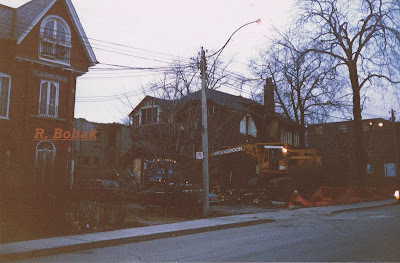 1985 - looking at the west side of Springhurst Ave., just south of King St., at the demolition of two houses, both of which faced onto the south side of King St. 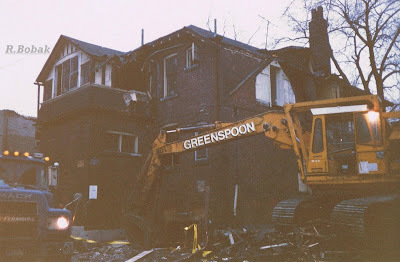 The house in the foreground was on the south-west corner of King and Springhurst. 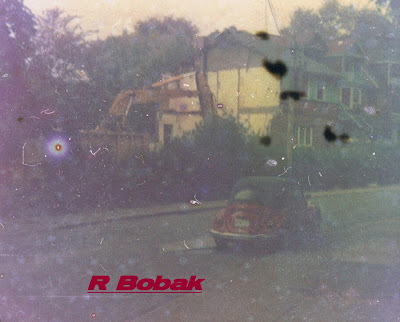 All below Photos taken by R. Bobak. below: looking at the south-west corner of King St. and Springhurst Ave. The streetcar tracks along King are seen along the bottom. below: looking at both houses, on the south side of King St., in an eastward direction towards Springhurst Ave.
below: closer view of the house directly on the south west corner of King and Springhurst. above: same view, Apr.13, 2009, where the two houses with trees once stood. The same office building (on the south-east corner of King and Springhurst) at the far left, is seen in above three shots. 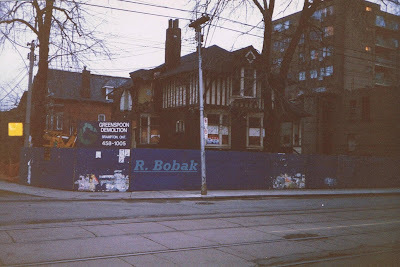 Where the No Frills is now was once a Dominion, with a bowling alley beneath. below: another closer view of the south-west corner of King and Springhurst. below: looking west down King St. , the house under demolition is at the left. In the centre lower right distance is seen the apt. bldng. 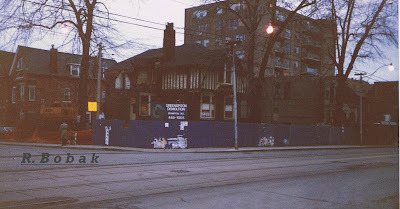 which is still on the north-west corner of King and Dowling Ave.
above: same view, the same apt. on Dowling is seen at the far right distance. below: the rear of the house on the south-west corner of King and Springhurst, taken from Springhurst Ave., looking at its south-east side. 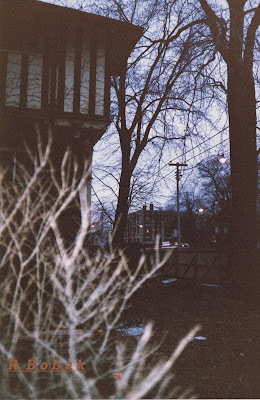 above: looking at the porch on the west side of the house which stood on the south-west corner of King and Springhurst. below: looking at the south-side of King St., at the second house west of Springhurst Ave., a laneway was at its west (right) side. above: same view, Apr.13, 2009; the roof of the same building (see arrow at the centre-right distance, down the laneway) is seen in both shots. Thanks for visiting Right In Niagara! 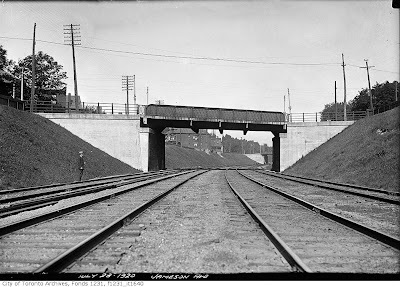 below: Jun.28, 1911 - looking east from Dowling Ave., over the Grand Trunk railway as the railroad track right of way is being excavated to a lower grade. 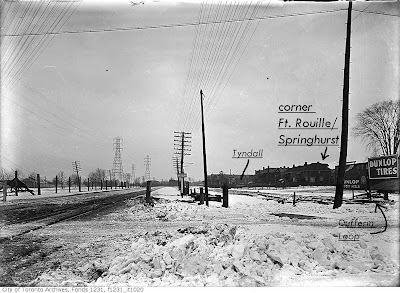 To the centre left is seen the temporary Grand Trunk South Parkdale railroad station which sat north of the tracks, on the south side of Springhurst Ave., just west of Jameson Ave., where Springhurst makes its curve turning north up to King St. The original older station had stood just east of Jameson Ave., between Jameson and Close Ave. It had to be torn down to allow the grade separation work to proceed. Note the houses seen behind the station at the left; these houses were, and still are, facing onto the north-east side curve of Springhurst Ave. The houses seen to the right, south of the tracks, were demolished in the mid 1950s to make way for an expanded Lakeshore Blvd., and a new Gardiner Expressway. above: same view, Mar.31, 2009 - Looking east from the original Dowling bridge. The temporary train station had been at centre left, about where the slope now is. A bit of the house roofs on Springhurst Ave. can be seen above the trees. At right, where the houses once stood, the grade has since been excavated, making way for the Jameson entrance ramp onto the westbound Gardiner. The bridge in the distance is the Jameson Ave. bridge. The original station had been located just past (just east of) the Jameson bridge. below: Mar.31, 2009 - a view of the same location from a bit further south; the Dowling Ave. bridge rail is in the foreground. The houses on Springhurst can be seen a bit better. above: Jun.28, 1911 - a closer view (cropped from the third-previous photo above) looking from the west, at the temporary South Parkdale railroad station, located on Springhurst Ave. west of Jameson Ave. Note - again - that this is NOT the original station (which had stood east of Jameson Ave, and was brick; this is the TEMPORARY station which stood WEST of Jameson Ave. and was wooden. 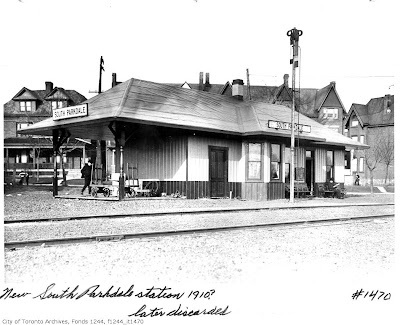 Many 'experts' keep repeating incorrect information that this photo shows the original south Parkdale station, but this is the temporary station. 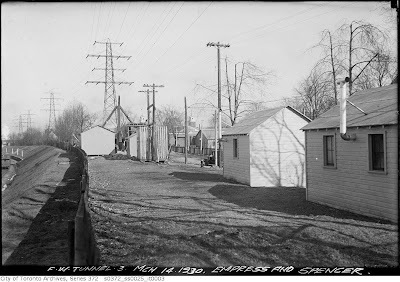 The houses on Springhurst Ave. (houses which are still there) can be clearly seen standing behind the temp station. below: ca.1910? 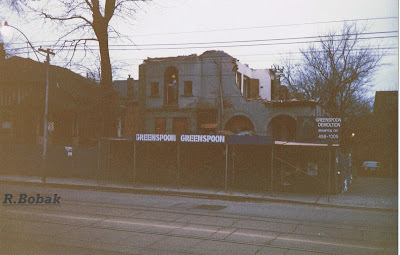 - this photo looks at the temporary South Parkdale station from the south, with the houses (which front onto the the north-side of Springhurst Ave.) seen in the background. The archive information which accompanied this photo (#1470) claimed that the station shown in this photo was located on the south side of Springhurst Ave. between Jameson and Close - however, that is incorrect info: the station which had stood between Jameson and Close (in other wards, the one which had stood just east of Jameson) was the original station. The temporary replacement station was built nearby, on the WEST side of Jameson, so that the original station could be torn down to allow work to begin on the grade excavation. 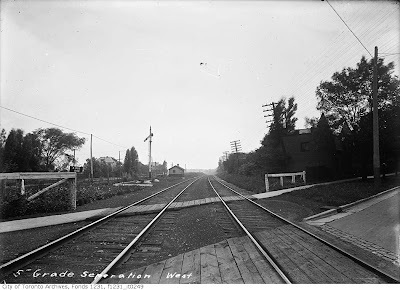 The station shown in this photo is clearly not the original station which stood east of Jameson; this is the interim "new" (as the caption on the photos says) station which is shown standing west of Jameson. 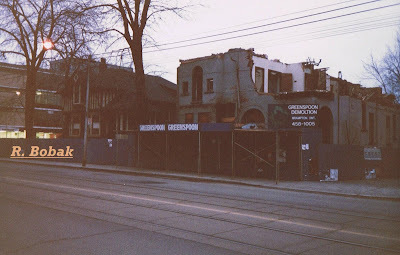 As the caption also reads, this station was "later discarded" when the new station at Sunnyside (where King St and Queen st. met, at Roncesvalles) was opened. 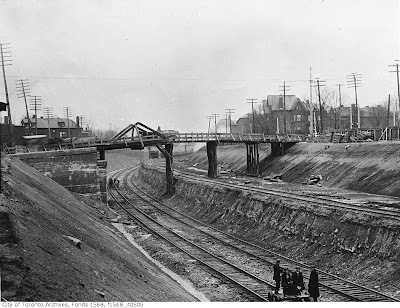 I have yet to find whether that brand new station which was built below the new Dufferin bridge was ever permanently used as a station - were the Dufferin and Sunnyside stations both active at the same time? I remember that GO trains and CN passenger trains had stopped at the Dufferin station during the EX on a seasonal basis. above: same view, Mar. 31, 2009 - in the foreground is where the Grand Trunk temporary railroad station had once stood. The same houses are seen along Springhurst in the background. above: Mar.31, 2009 - a wide angle view of the houses along the north-east curve of Springhurst Ave. which once faced the temporary Grand Trunk railway station across the street from them. The fence at the far right is at the top of the slope which drops down to the tracks. below: Jul.14, 2008 - looking eastward along the curve of Springhurst Ave., which turns northward to the right. To the left, where the trees are, is the where the slope starts heading down to the railroad tracks. The temporary station had stood somewhere at the left, along that grassed area or the parking lot. above: same view, ca.1980 - After the old station was torn down, and before the little grassed area, seen previously above, was there, for about eighty years houses stood on the west side of Springhurst at the curve, starting almost from the track-slope. For years, in the seventies, a row of these houses stood abandoned and boarded up, as a developer, Meridian, blockbusted the area; there were also abandoned houses facing the east side of Dowling Ave. which made up this large Springhurst/Dowling land assembly. The photo I took above shows the houses on the west side curve of Springhurst being demolished. below: same view as earlier, of the same houses on the west side of Springhurst Ave. under demolition; from a few steps further north. above: same view, Jul.14, 2008, new homes now sit where the old ones were. The temporary train station had once been in the area off to the left. 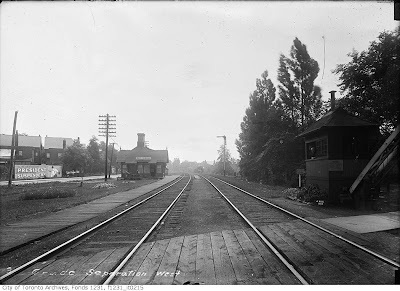 below: Aug.4, 1910 - looking east from Jameson Ave. at the original Grand Trunk South Parkdale station seen in the left distance, which was located on the south-side of Springhurst Ave. between Jameson and Close Ave. 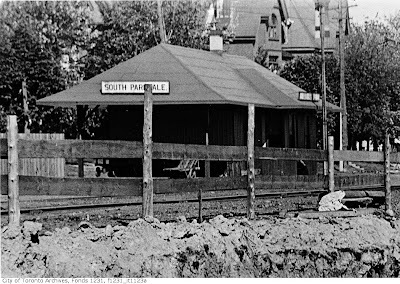 NOTE: to clarify - this station was the original south Parkdale station, and it was located EAST of Jameson Ave. NOT west of Jameson Ave. There seem to be few photos in existence of this station. 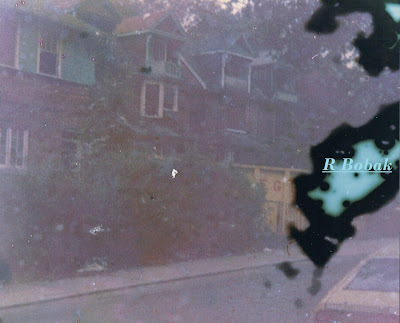 Springhurst Ave. is seen along the left; the level crossing of Jameson Ave. is seen at the bottom; more South Parkdale streets and houses, and Lake Ontario, would be off to the right, behind the tree-row. Note the signalman looking out of his shed at the bottom right, on the south-east side of the tracks along Jameson Ave. The timber planks seen along the bottom are the actual roadway of Jameson Ave.
above: Mar.31, 2009 - same view, looking east from the Jameson Ave. bridge, which now crosses the lowered tracks. The original station once stood about centre-left, where the slope is - today, that station would be standing in mid air, in the area above the slope and the northern two sets of rails. Springhurst is at the upper left, running parallel to the tracks, behind the trees. In the far distance is the Dunn Ave. bridge, and farther are the domes of buildings at the CNE. below: looking westwards towards the Jameson Ave. bridge under construction, as the railway grade separation is underway. The houses seen to the south (at left) have all since been demolished. Springhurst Ave. is seen along the right. Note the Victorian gabled house at the centre-right; it was located on the north-side of Springhurst Ave, a bit west of Jameson. Also note, that the temporary station was located on the west side of the new bridge (in the center-right distance, behind the bridge), however, it's not clear in this photo whether that station is still there at this point. Also, the original station would have stood at the very far right of the photo, just out of the frame; it would have stood above what is now the sloped cut. above: Mar.31, 2009 - same view, looking west towards the Jameson Ave. bridge. 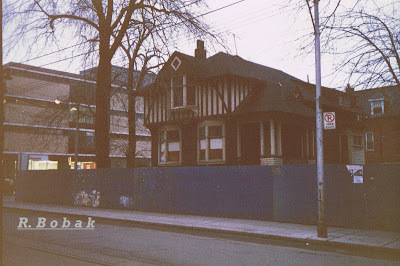 The same Victorian houses can still be seen at the centre-right, along Springhurst Ave., (behind the bridge, just to the left of the grey apartment building). Where the houses at the left had once stood, is now a highway. below: July 23, 1920 - looking westwards at the Jameson Ave. bridge, now completed; to the left (south) are seen houses at the top of the slope, which are since gone. In the distance around the curve, a bit of the Dowling Ave. bridge can be seen. Springhurst runs along the upper right. above: same view, Mar.31, 2009 - The Jameson Ave. bridge in the foreground, Dowling Ave. bridge in the distance. The area now seen at the left distance has been excavated for the Gardiner Expressway; in the previous view, there was still a slope there with houses at the top. below: Feb.9, 1911 - here is a westward view from Jameson Ave. before the grade separation: note the same Victorian houses along Springhurst Ave., seen at the centre-right. The original train station would have been located just behind the photographer's right shoulder. above: Mar.30, 2009 - same view, looking west from the Jameson Ave. bridge. The same Victorian houses on Springhurst are seen clearer at the right. In front of them is where the temporary station (seen earlier above) had once been. The Dowling Ave. bridge is in the distance. above: Mar.31, 2009 - same location, looking west across Dowling Ave.; bridge over the tracks is at left. The Gardiner Expressway is seen at the centre left distance. 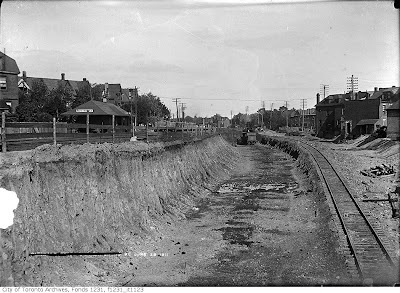 below: Mar.14, 1930 - looking east, standing south of the railway tracks, just about where Spencer Ave. and Empress Cres. were. 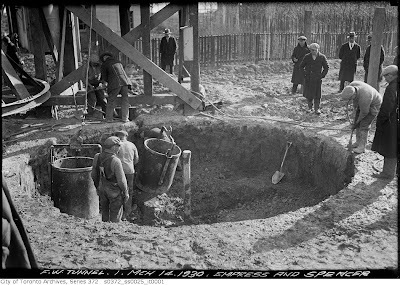 The short tower in the centre foreground (below the tall hydro lines) was where a deep water well was being drilled by the Toronto Water Works. 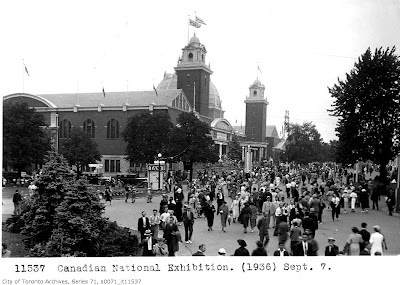 At the centre distance can clearly be seen the towers and round dome of the Arts and Crafts building at the CNE. At the far left can be seen the new train station which was built below and to the west of the Dufferin St. bridge. Where the hydro towers ran eventually was the path where the Gardiner would be built. above: Mar. 31, 2009 , same location - the tracks and now-abandoned station are at the left; the domes of the same buildings (now Medieval Times) in the CNE are still in the distance; the water well sits encased in a round concrete bunker at the right. above: the same capped well, Mar.31, 2009 - now on a slope overlooking the excavated Gardiner, with Lake Ontario in the distance. In the summer this is where tons of kids and their parents would come to watch the nightly fireworks during the CNE. Getting a place on the well was a prized seat for the show.